Check it out here: http://www.etsy.com/listing/71215220/yellow-with-green-snaps-boys-os-cloth, and be sure to come back often as I will be listing the others over the weekend. Being that this is a waterproof cover, it also makes for a great swim diaper! Just throw it over their swim suit while they are in the water, and easily unsnap it for playtime. Maybe you’ve picked out a perfect spring dress for your little princess, and you’ve even found the cutest shoes to match. Maybe you have even found the perfect hat or hair bow to compliment it. But-what about her diaper?! 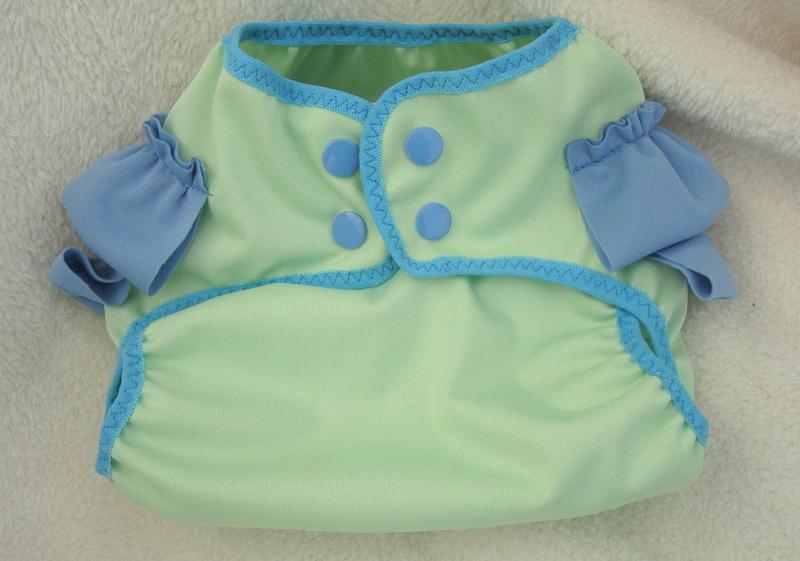 Have no fear, a new spring themed Ruffle Bottom diaper cover is here!! A base of buttery yellow, with 2 blue ruffles and blue snaps, this cover is too cute to cover with a dress, and perfect for pictures with lovely spring flowers! Be sure to check out the listing in my Free Rose Etsy store, order now to ensure you’ll have it in time for Easter dresses. These PUL covers are perfect for use with my Tri-Fold Organic Bamboo Inserts. You’ll find that they combine to make for a trim diaper, and are an affordable way to use natural fibers. Purchase together and save 10% off the inserts if purchased together, convo me for a custom listing with the discount. This item can also be used over disposable diapers as bloomers. Additionally, since it is waterproof, it will also make an ideal swim diaper cover over a swimsuit.